3sixteen is going high class with it’s new lookbook. I love the direction they’ve been going in. I personally can’t wait till the fleece field jacket drops. That will defiantly be on my Christmas list if anyone wants to know. 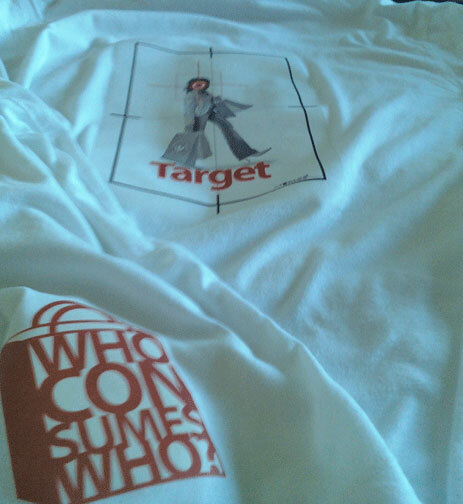 Made a proof for the target T-shirt. I stopped by my favorite street wear boutique in Boston today. The Re-Up has got to have the nicest people working there. Having worked in Customer service for many years, it is a huge thing for me, and they got plenty of it. Everyone is very chill and really helpful. Just finished a few pieces of propaganda (advertisment) for the website. 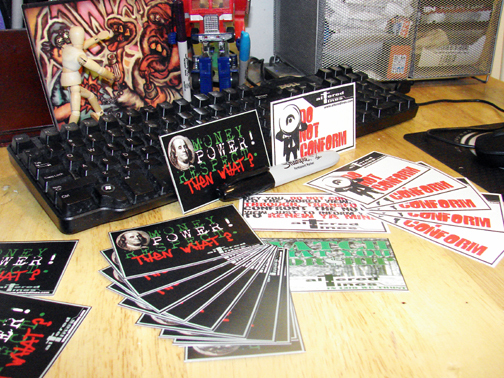 The Do Not Conform is a brand new design (thanks Banksy for the inspiration) but the Money, Power! Respect? has been around for a minute, but never quite worked out as a design. It was inspired by the song of the same name by the Lox, later redone by lil’ Kim. I think (hope) it has finally come together as a design. Just goes to show We have to constantly be working on that stuff ya’ll, That’s part of what the “Dig Deeper” tag line for the company is all about. Same as the popular “Do Work, Son” is now, only ours goes a little deeper… Oh, I’m so punny!